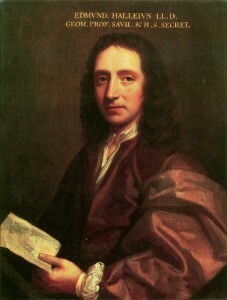 Halley was born on November 8, 1656, near London, England, into a wealthy family. He entered Oxford University in 1673 to study astronomy and published a paper on planetary motion. This paper earned him the opportunity to spend two years on St. Helena, a southern Atlantic island, charting the stars of the southern sky. This task yielded the first compilation of telescopically determined star positions and prompted Oxford to grant Halley a master’s degree in 1678. Halley befriended English physicist ISAAC NEWTON in 1684. Newton’s theory of gravitational force extended to the celestial sphere and helped to explain the elliptical shape of planetary orbits. Halley encouraged him to expand and publish this work. In 1687 Newton’s Principia (Mathematical Principles of Natural Philosophy), edited and financed by Halley, was printed. Upon viewing a comet that appeared in 1682, Halley began studying cometary motion. He gathered data on every comet that had been observed since 1337 and computed their orbits; his calculations suggested that the famous comets sighted in 1531, 1607, and 1682 were one and the same. In A Synopsis of the Astronomy of Comets (1705) he accurately predicted this comet would reappear in 1758 or 1759; this comet is now known as Halley’s Comet. In other astronomical research Halley devised a method for determining the distance of Earth from the Sun by using procedures he had already developed for observing the transit of Venus across the Sun—which would not occur until 1761. Finding extensive incongruities between historical and current star charts, he concluded, contrary to traditional doctrine, that stars move. Halley died on January 14, 1742, in Greenwich, England. In 1761 astronomers at 62 stations around the planet observed the transit of Venus mapped out by Halley earlier in the century. Based on measurements of the planets passage, they calculated the distance from Earth to the Sun; their value was 153 million kilometers, surprisingly close to the modern value of 149.6 million kilometers. Halley’s support was crucial to the publication of Newton’s Principia, considered a masterpiece of scientific thought. In it Newton codified the laws of motion and universal gravitation, firmly uniting the heavens and Earth under a single system of mechanical motion. In 1758 Halley’s Comet (as it was thereafter known) appeared, confirming that comets are bodies that orbit the Sun and not, as some believed, meteorological phenomena. A frenzy of interest in comets began. In 1818 German astronomer Johann Encke calculated the orbit of a comet observed the previous year. Encke’s comet has an orbital period of three and a half years, the shortest cometary period known to date; it is visible (with instruments) throughout its orbit. Halley’s Comet reappeared in 1835, 1910, and 1986, enabling astronomers to study its characteristics and those of comets in general Comets consist of a nucleus containing rock, dirt, and ice, and a tail of dust and gas. They follow elliptical orbits, traveling in the opposite direction of the planets. Halley’s Comet is the only comet to be visible to the unaided eye each time (every 76 to 79 years) it passes nearby. During its 1986 appearance, six unmanned spacecraft were launched to observe and make measurements of its chemical composition and to determine the nature and evolution of its nucleus. Posted on March 8, 2015 by Natalie. This entry was posted in Astronomers. Bookmark the permalink.